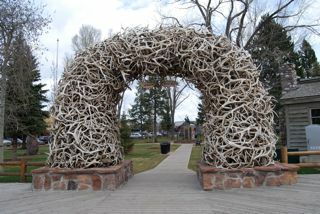 Last week, I had my first visit to the Grand Tetons and Jackson Hole (or Jackson as the locals refer to it). From Gardiner, we drove the entire length of Yellowstone, a 4 hour trip from the north to south entrance. For added excitement, the weather offered a constant snowstorm for our trip. Although I wasn't in Jackson for the most exicting of reasons--I was attending a training on storage tank compliance--I enjoyed the trip. 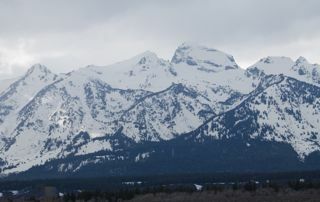 The Grand Tetons remind me of the Eastern Sierra landscape and Jackson has a little California flavor--with a western flair. 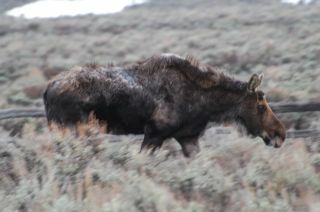 I also had my first moose sighting out here as we passed through Grand Teton National Park. No sign of Harrison Ford, but you can bet I kept my eyes open for a sighting. 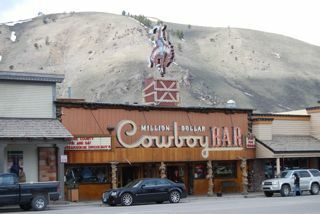 I'll be making a trip to Bozeman at the end of the month for the new Indiana Jones movie--can you believe it's been almost 30 years since the last one? The movers are due in tomorrow morning (keep your fingers crossed! ), so with the help of a co-worker's air mattress, I decided to camp out in my new home tonight. After over a week of being on the road and in hotels, it's nice to be in a home of sorts. I'm relaxing by the fire and reading my new Vanity Fair (with Harrison Ford on the cover--Indy's Back!) and snacking on pizza from MacKenzie River Pizza in Bozeman. I made a trip to Bozeman today to pick up groceries and some things for the house--it's a great college town with much to offer. P.S. Check out yesterday's Washington Post style section. My talented BFF Jack Laws is featured in an article titled: "In the Sierra Nevada, A Modern Audubon Stalks Skinks & Bugs."